We all remember the lesson we learned while in grade school concerning the growth of trees - tree growth is dependent on roots in the ground and leaves in the air. This is the core to understanding the relationship between water and wood. The roots of the tree collect moisture and nutrients from the soils and relay them through vessels or fibers up the trunk and branches to the leaves. These vessels run vertically in a standing forest tree. Cut the tree down, however, and these vessels or fibers become horizontal. Wood is hygroscopic which means, when exposed to air, wood will lose or gain moisture until it is in balance with the humidity and temperature of the air. 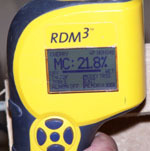 Change the relative humidity by 50 percent and you'll have a 10 percent change in moisture content of the wood. This is the reason why storage of woods used for wood-fired cooking is so vital. At SmokinLicious Gourmet Wood Products, we recommend that all our gourmet woods be stored in a dry, cool, light-free location. We also recommend that the wood be placed in a well ventilated container (i.e. a cardboard box with air-holes punched in it, an open wood crate, or any container that will allow air to circulate). By now, you know that the key to an exceptional smoking event is to have hardwoods that retain some level of moisture, preferably ~20%. The higher the moisture level, the more smoke that will be generated. SmokinLicious® Gourmet Wood Products harvests ours woods from the forests of Western New York and Pennsylvania, where the trees are known to have high moisture levels. Despite this, SmokinLicious® Gourmet Wood Products wants to ensure that the consumer receives the freshest, highest quality, and moistest hardwood. Therefore, we are the only manufacturer of gourmet wood products for wood-fired cooking methods that takes moisture readings of each and every product just prior to shipping. Of course, if the end use is not for traditional hot smoking but for charring or searing or even cold smoking, then the moisture level will need to be adjusted in order to facilitate the optimal outcome for these cooking techniques. When you purchase one of our gourmet wood products, you will find an insert in the package that will tell you the moisture level of the wood at the time of packaging. We are the only company manufacturing gourmet wood products to do this step. We include the moisture reading on everything from Hickory chunks to Wild Cherry chips. On average, our gourmet wood products have the following moisture levels: Gourmet wood chunks = 22.4%,Gourmet wood chips = 20%, Gourmet barrel smoking logs = 25.86%; Gourmet Smokin' Dust = 12%. Please note that these figures are an average of the eight wood species we currently supply. Thus, certain species will have higher moisture levels due to the porousness of the wood (i.e. red oak chunks have a much higher moisture level than Wild Cherry - nearly 2:1). As a result of the high moisture content, our gourmet wood products provide that winning edge to barbecue competitors throughout the world and prove that woods derived from the center of the tree, known as the heart or main artery, are by far the best products for smoking and natural grilling. See Moisture guide Moist Table that will provide additional information on the specific needs to soak the wood. It is our intention to empower the consumer with enough information on the qualities of an appropriate smoking wood, that they will not find themselves the owner of a package of firewood, or wood products that are designed to be a fuel source not a smoking source.